I am frequently asked to explain what my painful disorder is. You may have heard of others saying they have clicking or popping in their jaw - and that is what you associate TMJ with. Well, that is only a MILD case of what I have. Mine is a very extreme and very serious case. So serious that others have committed suicide over the daily and incurable pain. In simple terms - my Discs's are out of place. We all have a disc on each side of our faces, immediately in front of our ears. This disc provides a cushioning effect in between where the lower jaw connects to our skull. Because both of my (left / right) discs are "out of place" - I AM LEFT WITH BARE BONES RUBBING. Over the past 4 years, it has turned arthritic. My TMJ's are dis-placed as a result from the way my head banged off the windshield and was tossed around the car. My jaw is also mis-aligned from the crashes. - now my mouth and TMJ's are grossly mis-aligned. It has caused misalignment's in other areas of the body, such as the spine, shoulders, hips, and ankles. The body’s effort to compensate for a misalignment in the cranium, causes misalignment's elsewhere and puts a great deal of stress on the muscles of the face, head, neck and back. 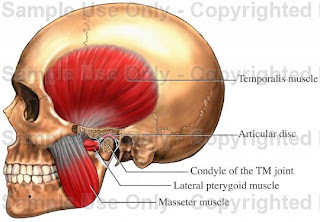 A. TMJ = Temporomandibular Joint. B. The TMJ’s are the joints that connect the lower jaw (Mandible) to the skull. C. They are very important joints in the body because they are active in chewing, talking, swallowing, and any other motion involving the mouth and face. The Temporo-Mandibular Joint is a complicated, poorly understood network of nerves, muscles, cartilage, fluids and bone. It is also one of the most complex joints in the body, performing multiple, vital functions. The temporo-mandibular joints are Joints located on either side of the face that connect the lower jaw to the skull. The joints work in synergy with the facial bones and multiple pairs of muscles to allow opening and closing of the mouth & forward, backward, rotational and side-to-side movements of the lower jaw. Affecting muscles and joints on ALL areas of the face, neck & back. When muscles & joints are not working together, muscle spasms occur - producing pain and dysfunction. With TMJd, Muscles in the face, neck & back are working constantly - EVEN DURING SLEEP - causing them to become overworked - leading to muscle fatigue, spams and inflammation. TO THE RIGHT:That is a diagram of every muscle that is attacked/affected by the TMJd (Temporo-Mandibular Joint Disorder).Every time that my TMJd flares up, I experience a blow up of intense pain in everyone of those muscles! Everything from the shoulders & up is greatly tormented. 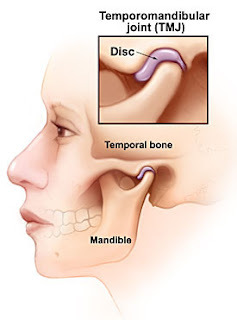 The temporomandibular joint (TMJ) connects the lower jaw, called the mandible, to the temporal bone at the side of the head. If you place your fingers just in front of your ears and open your mouth, you can feel the joint on each side of your head. Because these joints are flexible, the jaw can move smoothly up and down and side to side, enabling us to talk, chew and yawn. 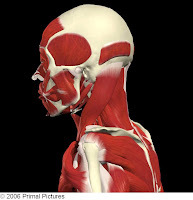 Muscles attached to and surrounding the jaw joint control its position and movement. generative joint disease, such as osteoarthritis or rheumatoid arthritis in the jaw joint. *pain in the face, *neck, or *back, *migraine or *generalized headaches, *eye problems, *sinus trouble, *hearing loss, *earaches, *clogging or *ringing in the ears, *visual and *motor incoordination, *learning disability, *low energy level, *any pain or joint noises in the jaw area, *difficulty swallowing, *dental distress, *bruxism, *tingling or numbness in the arms, hands or fingers, and a *myriad of problems dealing with the spine and structure. It usually stems from a malformation, degradation, or displacement of the TMJ’s. Misaligned bites will cause misalignment's in other areas of the body, such as the spine, shoulders, hips, and ankles. The body’s effort to compensate for a misalignment in the cranium, causes misalignment's elsewhere and puts a great deal of stress on the muscles of the face, head, neck and back. It is unreal when I stop to think that prior to 10/12/2004, I never knew what "debilitating" physical pain was. 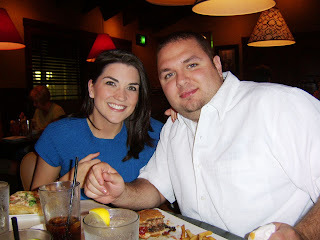 I never knew TMJd existed and most importantly my husband & I lived a carefree, fruitful and exciting life in the glamorous city of Las Vegas, NV. Just home visiting Buffalo, NY and an elderly driver fails to yield, causing a car crash that has FOREVER changed the course of mine & my husbands life. My car crashes caused a SEVERE disability of TMJd and I now live in a chronic and debilitating state of pain. At any unexpected moment, I can be shut down for weeks! This disorder is only comparable to living in a nightmare and has proved devastating in many ways. When speaking to others who live with this, the devastation is all the same! I AM NOT ALONE!!! There are 10 million + people in the United States suffering from TMJ problems at any given time. Both men and women experience it; however, 90% of those seeking treatment are women in their childbearing years. 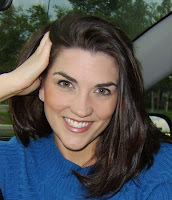 PAIN WORSE THAN CHILDBIRTH : I have communicated with thousands of others undergoing the same condition. Woman who have given birth explained that the pain caused by TMJd is WORSE than the time(s) they gave birth. Imagine that, enduring something on a consistent basis that is worse than the pain caused by child birth. When Doug and I start our family - it should be a breeze for us! LOL....there is the only plus of this disorder! It boggles my mind that over 10 million people in the USA live with an incredibly debilitating nightmare within their Temporo-Mandibular Joints. A nightmare that steals what abilities we as adults take for granted - Eating, Chewing, Swallowing, Smiling, Hearing, Kissing, Talking, Breathing, Sleeping and much more. Imagine having that stolen from you at any given, unexpected moment. AND THEN be told that there is no science behind it, no cure and NOTHING to alleviate the pain. THE only reference you get is to seek a specialist who specifically treats cancer as they will understand the level of pain experienced. LASTLY, it is emphasized that pharmacological strategies and therapies need to be utilized to alleviate TMJ-related pain. THAT IS MY LIFE - I HAVE TRIED EVERY NON-INVASIVE PROCEDURE AND 4 years later I am still forced to awake at 4 am in gut wrenching pain and my husband forcing me to take high doses of morphine! 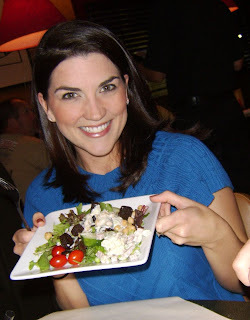 9/14/2008 ~ My 29th Birthday! I AM 29! This is the last year I will celebrate a 20something birthday. It truly amazes me how quickly life can pass us by, especially when the last 4 years of my life have been consumed by car crashes, severe injuries and grueling rehab. Dad: I look at you and immediately thank the Lord that you and I are able to sit at a table and eat dinner, laugh and joke. I say that because it was exactly 3 years ago a near-fatal car crash nearly claimed our lives. I love you dad! Mom: I'll never forget that it was really your day..LOL...you were in labor for over 20 hours...sorry BUT thank you! Doug: Thank you for today. 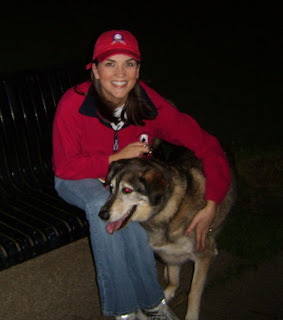 My card made me cry a river, my trip to "Our Lady of Fatima" was heavenly and the late night walk with the dogs topped it all off. *Most importantly, thank you for caring for my 3 tmjd episodes today. I do NOT know how you can possibly continue to care for this disability but you do. God Bless you! THIS IS ONE OF MY FAVORITE ACTIVITIES - TAKING THE KIDS FOR A WALK. It is one of the most relaxing things our family can do! Doug and his baby girl, Chloe'. She LOVES her belly rubs! We take great self-portraits, don't we? EARLIER THAT DAY - we went to the "OUR LADY OF FATIMA SHRINE" That is one of my most favorite places on earth!! We spent 45 minutes in the gift shop! 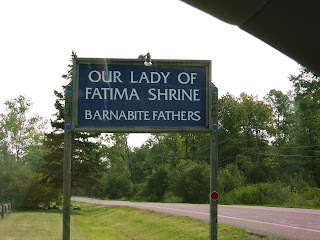 Driving along the river...a 45 minute drive to get the the Fatima Shrine! YUP!! It happens on my Birthday too!! We had to rush home from lunch b/c of the TMJd episode I was having. It was horrible and knocked me out for 4 hours! That is my upper piece that I have to wear to RE-ALIGN my jaw- it is grossly misaligned right now! You can't go wrong if your being true to yourself. Your REAL self - Not the one everyone else wants you to be. That is when the really good stuff happens! Today was the annual Jerry Lewis, MDA Telethon. I joined Peter DeLacy of DeLacy Ford to present a check in the amount of $50,000.00 (on behalf of DeLacy Ford). Working with DeLacy Ford has afforded me opportunities and experiences of a lifetime. One of them was working with the MDA at their local "Lock-Ups." DeLacy sponsored the use of their vehicles to transport the "jailbirds." I went to the events as a DeLacy spokesperson and I was able to see first hand, all of the fundraising and hard work that goes into each one. I also was able to see the fun experience it provided each participant. This was a perfect way to end this particular affiliation and I wish the organization much success.